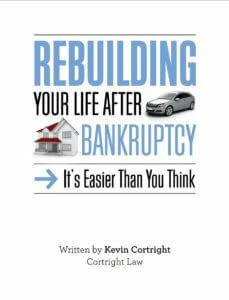 Temecula Bankruptcy Attorney Kevin Cortright wrote this book in order to help people whose lives are deep in debt. He wants to help them get their feet back on solid ground and to understand that there are many viable options, including filing for Bankruptcy, that can help them start their lives fresh. Filing for Bankruptcy allows those that are deep in debt to breathe a sigh of relief and have financial peace of mind. Tired of wage garnishments, IRS issues, creditor calls, law suits, home foreclosures, and bank levies? Mr. Cortright details in his eBook how you can change the trajectory of your life by filing Bankruptcy. It’s time to get started actually saving money and paying your bills on time by using Bankruptcy as a stepping stone to a better life. “Rebuilding Your Life After Bankruptcy” contains the following chapters: The Kindest Thing You Can Do For Yourself, Five Steps to Recovering from Bankruptcy, Facing Your Fears, Starting — and STAT!, Opening New Lines of Credit, The Promise of Intentionality and how to Communicate Clearly, Directly, and Honestly. If you are interested in learning how to gain your life back through filing Bankruptcy process, read Kevin Cortright’s new eBook for FREE! As an experienced Temecula Bankruptcy Attorney, Kevin Cortright can guide those contemplating Bankruptcy to rebuilding their lives after Bankruptcy. If you would like to learn more about filing Bankruptcy and what Attorney Kevin Cortright can do for you, visit our Bankruptcy page.